Sciency Thoughts: Eruptions on Mount Nabro, Eritrea. Eruptions on Mount Nabro, Eritrea. Mount Nabro is a stratovolcano (a cone-shaped volcano of the kind seen in Hollywood movies, made up of successive layers of ash an lava) in the southeast Danakil Desert in Eritrea, close to the Ethiopian border. It forms part of the Bidu Volcanic Complex, along with the Dubbi and Sork Ale volcanoes in Eritrea and Mallahle and Bara Ale volcanoes in Ethiopia. Until this year there have been no recorded eruptions at Nabro, and it had been assumed to be extinct, though due to its remote location it had not been studied extensively. Satellite image of Mount Nabro. On 12 June 2011 the area around Mount Nabro was shaken be a series of earthquakes, which rose in intensity throughout the day. At approximately 9 pm local time on 13 June a large volcanic eruption took place in the region, creating a column of ash that rose 13.5 km into the air. At first this was thought to have been caused by an explosion on Mount Dubbi, the only volcano in the area to have erupted in recorded history (in 1861), causing concerns for the settlement of Afambo, which is close to Dubbi, but Nabro was later identified as the source of the eruption from satellite photographs. Within hours the ash column had started to cause disruption to flights in the region. 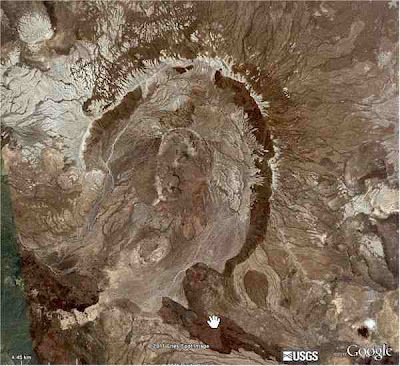 Satellite image of the eruption on Mount Nabro. On 16 June the Eritrean Government announced an evacuation of the people of Afambo, Nebro and Sireru, the three settlements closest to the eruption. By the end of June the ash cloud had cleared sufficiently for NASA to obtain pictures of the situation on the ground, revealing that a large amount of lava had issued from the caldera of the volcano, producing a flow of lava that extended westwards for over 12 km before producing a lava lake. It was also becoming apparent by this point that the evacuation by the Eritrean Government had not been entirely successful and that seven people in Eritrea had lost their lives as a result of the eruption, and a further three had been injured. 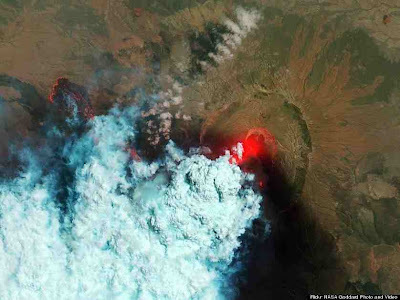 Satellite image of the lava flows from Mount Nabro. A week later the neighboring Ethiopian state of Afar reveled that at least 31 people had died their, and that the local government was having extreme difficulty coping with deteriorating environmental conditions associated with the eruption, particularly water pollution and damage to crops and livestock. The Afar Government estimated that 48 000 people were in immediate danger from the ash-fall and that over 167 000 more were potentially at risk. Clouds of poisonous sulphur dioxide gas were also reported to be blowing across the border. It launched an appeal for aid, but this was overruled by the Federal Ethiopian Government in Addis Ababa. On 9 September 2011 the area began to experience seismic activity again with small earthquakes persisting for the next three days. 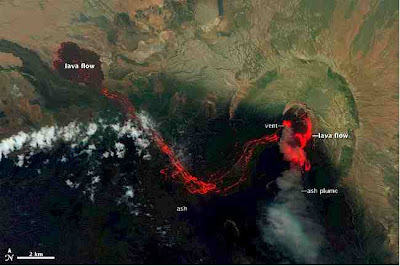 On 28 September NASA again reported sighting fresh lava flows on Mount Nabro. The Bidu Volcanic Complex is located on the Afar Triple Junction, a complex area tectonically, where three spreading plate margins meet. To the northwest the Red Sea Rift runs between Africa and the Arabian Peninsula, a new ocean ridge where oceanic crust is being formed, with the potential to turn the Red Sea into an ocean over the next few million years. To the northeast the Aden Ridge forms a similar divergent margin between the Arabian Peninsula and the Indian Ocean, although in this case both plates are moving northward, the Arabian Peninsula is simply moving faster than the Indian Ocean for the time being. It is likely that as Arabia collides with Eurasia it will slow down and the Indian Ocean will overtake it, closing the Aden Rift. To the south the Great Rift Valley is slowly splitting Africa in two, creating a long chain of volcanoes heading south to Mozambique. 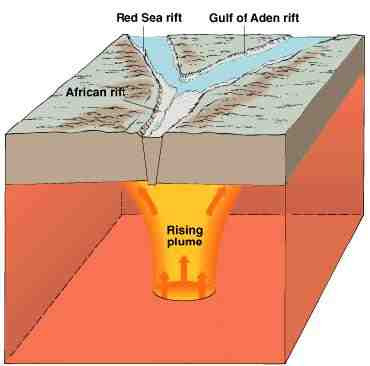 Some geologists believe that a mantle plume beneath the Afar Triangle is fueling this, pushing the plates apart rather than their being drawn apart by seismic activity elsewhere. See also Tourists evacuated due to volcanic activity on El Hierro, The Dangers of a modern Laki-style eruption in Iceland and Volcanoes on Sciency Thoughts YouTube. Moros intrepidus: A small Tyrannosauroid Theropod from the early Late Cretaceous of Utah. Could we mine the moon for titanium? A re-evaluation of the Iwo Eleru skull. A Sei Whale stranded in the Humber Estuary.